I moved to Los Angeles for the filmgoing, sure — how many other cities offer the chance to experience all eras of cinema, theatrically, pretty much every week? — but also for the post-film-Q&A-watching. Enough filmmakers and filmmakers’ collaborators live in or regularly pass through town that theater programmers don’t have to strain to add an enticing liveness to a screening: “Director in person!” “A conversation between the writer and cinematographer to follow!” “Three of the supporting cast will probably turn up!” Some become regulars: the guy who wrote Electra Glide in Blue’s screenplay seems happy to appear whenever and wherever the movie gets projected, for instance, and Los Angeles Plays Itself director Thom Andersen fields an hour of audience questions every time I catch his documentary. And sometimes you hit a surprise jackpot, as when not just Quentin Tarantino but Robert Forster and Pam Grier took the stage after the Los Angeles County Museum of Art played Jackie Brown. That Q&A fired on all cylinders, which not all of them do. But this very element of suspense keeps them interesting, as does the fact that you can never quite know in advance which ones will, to mix the metaphor, give off sparks. There, on another night, I saw Shane Carruth, he of Upstream Color, discuss his first film Primer with USC physicist Clifford V. Johnson. Had I braved even standier-room-only conditions on a later night, I could have seen Johnson and Carruth (who provided time-travel consultation on Looper) talk Upstream Color. I opted instead to hear that evening on an episode of The Q&A which combines it with Goldsmith’s own interview of Carruth at his usual venue, someplace called the Los Angeles Film School, whose name sounds faintly scammy but which must bring enough legitimacy to attract a cinephile of Goldsmith’s standing. 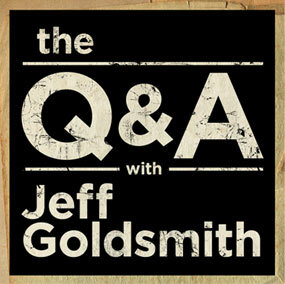 It doesn’t surprise me that students of film production would dig Goldsmith’s interviewing style. He asks the questions you’d expect about process, budget, and schedule, and in his having a standard line of inquiry to fall back on, as well as his playing to audiences of eager learners and his tendency to conduct what we might call praise-intensive conversations, he reminds me at times of a non-octogenarian James Lipton from Inside the Actors Studio. Goldsmith’s version of Liptonism also features pre-written “geek questions,” those hair-splitting inquiries about plot minutia that you resent other audience members for squandering minutes of our valuable lives asking but which he somehow makes endearing. The geek questions, needless to say, get a field day after new-wave science fiction films like Primer and Looper, but Goldsmith has many other modes as well, which he switches between with startling efficiency. One week he’ll ask a director about the ways he circumvents the deadening conventions of the screenwriting process; another week he’ll ask a writer, with equal interest and earnestness, how he managed to adhere to those same conventions so successfully. But when Goldsmith talks to, say, Christopher McQuarrie about writing Jack Reacher, he doesn’t ask only about how best to craft studio-pleasing character arcs. Rather, he asks about that, but the conversation then shifts toward more meaningful points. I’ll always remember McQuarrie telling Goldsmith that experience, credentials, intelligence and skill all fall distantly secondary to whether people like having you around, a principle I suspect holds for every field of human endeavor. Woody Allen’s words about the attainment of a modest mastery by simply working, working, and working some more over long spans of time, even though he says them in an episode not hosted by Goldsmith himself, will also stick with me. The Q&A delivers such deposits of universally golden wisdom with unusual regularity, and the more eccentric but endlessly fascinating Carruth drops one of them every few minutes during his appearance. He casts much light on how each element of filmmaking — writing, shooting, scoring, cutting — constantly informs all the others in a kind of perpetual creative cycle, and explains (to my mind once and for all) why a plot needs a core of unanswered, even unanswerable questions. Goldsmith even includes in the podcast, during his usual open-it-up-to-the-audience segment, an eloquent, impassioned, seemingly minutes-long declaration from my aforementioned colleague that Upstream Color indicts the modern condition: “Something happened. It was horrible. It happened to the environment; it happened inside us. It prevents us from talking to one another, or knowing what we’re saying when we talk. Whether God moved away from us or chemicals approached us, it doesn’t matter; we all feel this Martian, alienated state. And it’s our time.” But Goldsmith and Carruth also get into the nuts and bolts of do-it-yourself distribution, if you tuned in for that.